The rooting of cuttings from the juvenile stage of many species of Eucalyp -tus is relatively easy and a common practice in Australia and in North Afric but the propagation of adult trees from cuttings is generally im- possible. Since 1956, it has been shown that after grafting and especially cutting back, it is possible to root the cutting taken from the new fuvenile shoots, taken from trees over 30 years old. In addition the rooting of cuttings taken from the first generation of rooted cuttings increased from 8 to 60%. These initial experiments indicated that it could be possible to mass pro- duce clones of adult Eucalyptus camaldulensis. This was attempted in Tunisia and has since been obtained in the Congo and in Brasil. This mothod of industrial production of rooted cuttings from selected adult trees, revolutionizes the classical means for the genetical improment of forest trees. Since 1973, Afocel has studied the use of micropropagation in vitro for the mass production of clones of Eucalptus selected for their cold resis-tance in France, The pioneer works on E. grandis con-firmed earlier resukts indicating the possibility of in vitro propagation of some species of Eucalyptus. This success encouraged the work with young plants produced from seeds grown in intro, or fuvenile sprouts from stock plants, and with young plants or new shoots from adult scions grafted onto fuvenile seedlings. The few plants resulting from these trials were successfully planted in the field in 1975 and this led to an extension of the work by developing clones from 2 year old trees which were selected for a natural resistance to cold conditions in the Marvejols area. Here we shall describe the techniques developed after a year of intensive research which led to a pilot production of about 25,000 plants per month. This programme consisted of taking seeds from trees planted about 1950 which had survived the cold winters (approx -20 ) of 1956 and 1963. The seeds were collected mainly from E. gunnii, E. dalrympleana, E. pauciflor and E. delegatensis as recommended by professor pryor in 1976. The seeds were sown in pots, after reaching the colyledonary stage the seed- lings were replanted in to “Melfert” culture containers which are particu-larly suitable for the growth of Eucalyptus. During the summer, these plants were transferred to large plastic boxes with holes and filled with soil. rst cold. After two winters in the field the most resistant and most vigorous plants were cut back, cuttings were grafted onto young seedlings and the new growth from this stock was sent to the laboratory at Etancon for mass propagation in intro. Thus in july 1980, this technique of mass production was done with the new growth of 13 individ- uals from winter selection in 1978/79 and 1979/80. It is important to underline that even though the clones were entering their 3rd year, the were still relatively juvenile because a continual supply of juvenile sprouts was obtained by the cutting back operation. Trials using parts of branches taken from the same clones which were not cut back failed but not from lack of reactivity but because of infection. The tissues from the cut back plants are the origin of the actual industrial cultures. Thus this justi-fies the work being done on the stimulation of rejuvenalized growth on scions of adult trees by spraying with cytokinins. Plants sprayed with solution of methanol/water with 50 mg/l of benzylamino- purine produced an abundance of apparently axillary and perhaps adventive buds whose morphology appears to be promising even for horticultural type cuttings in situ. These results are in agreement with those recently published for E. ficifolia and for pinus pinaster. The following mothods are presently being used at AFOCEL. As soon as the branches are taken from the mother plant, the cut ends are sealed with paraffin and dipped for 8 minutes in filtered calcium hypochlorite solution. Then the branches are rinsed two times in sterile water and cut into segments consisting of one node an 1/3rd of each of 2 leaves. Each cutting is planted upright in an agar medium in a 25 x 150mm tube with a cellulose stopper. The culture medium used(medium I) is that of Murashige and skoog (1962) modified by a reduction of the calcium by on third. There is a high cytokinin/auxin balance, Bap 1 mg/l, NAA 10-2 mg/l. In order to avoid browning of the tissues and the medium, the tissues must be excised and immediately placed in the dark in a culture room at 250C. If the plants have been grown in a glasshouse and sprayed with the fungicide benomyl 24 to 48 hours before the branches are taken, then less than 40% of the cultures become contaminated in vitro. After 8 days darkness, the cultures are transferred to a culture room with photo-thermoperiod of 16 hours light (2 x 40 w Sylvania Gro -lux tubes 30 cm from the cultures) at 250C and 8 hours darkness at 20 0C. After 2 or 3 weeks on medium I, axillary and proventive buds multiply and develop. Generally, the proventive buds give the best results in the multipli- cation stages. These buds are separated and transplanted as soon as possible before the development of suffocating callus from the abscission layers on the petiole. 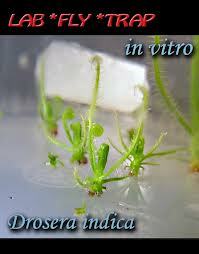 Cytokinins were not used in the medium for the propagation of very young seedlings. Multiplication resulted from the repeated elongation and dicision of the axillary buds. The technique adopted for 1 to 2 year old clones selected for cold hardiness resembles the one used by de Fossard et al shoots isolated from the primary cultures are transferred either in the first, third or fourth subculture depending on the clone, onto the multiplication medium. This differs from medium I by the vitamins and by a reduction of Bap from 1mg/l to 0.1 mg.l with NAA at 10-2 mg/l in both media. If the multiplication is continued on medium I, the tissues very rapidly become transparent with fragile leaves and stems. Multiplication on medium II results in intense axillary budding. The leaves become small and thick and have a cotyledonary morphology and a purple colored lower surface. The very short internodes thicken and bunches of buds grow in all directions even within the agar itself. Reduction of the Bap prescribed for medium II. leads to a reduction in the multiplication rate but allows a stability of the physiological state of the stock in relation to the rhythm of the subcultures. With monthly subcultures and stabilized climatic conditions, a multiplication rate of mor than ten per month can be obtained. Contrary to the method of other workers which requires a careful dissection of the small shoots into nodes, in this method the clumps of bubs are simply divided into ten subcolonies. Further dissection of these colonies easily produces a propagation rate of more than 30 per culture. To stimulate elongation of the shoots and to obtain a favourable leaf morphology, two factors, activated charcoal and gibberellic acid were tested, at first separately, then together. Gibberellic acid in the range 0.01 mg/l to 10 mg/l was added to the medium II before autoclaving. All the concentrations higher than 1 mg/l lead to a considerable elongation of the internodes of the transferred shoots had a undesired morphology, the round leaves became longer and pointed and their dimensions were reduced from the base to the apex of the stem. at the same time, the internodes increased from 1 mm to more than 15 mm. These phenomena occurs in 90% of the cases. However, media containing less than 0.5 mg/l gibberellin, though causing less elongation produced healthier tissues, and better rooting and planting stock. At the same time the effect of activated charcoal, added to medium II, on the elongation growth of buds from subcultures on medium II was studied. Adding 1 g/l of activated charcoal to medium II favoured the elongation of one of the bubs of the subculture. During the elongation, the leaf morphology and color evolved towards that of cutting of young seedlings obtained in vitro. This elongation, unfortunately, was relatively small and slow, and since only one bud grew, it was too low to be of practical value. Then gibberellin and activated charcoal were tested together. as a result of factorial trials with diverse concentrations of gibberellin and activated charcoal added to medium II before autoclaving, medium III, called elongation Bap 0.1 mg/l, NAA 10-2 mg/l with 1 mg/l gibberellin and 15 mg/l activated charcoal. On this medium 3 to 4 stems per colony of buds grow sufficiently after 15 to 20 days to give cuttings with large well pigmented leaves and which are apt to root. The shoots thus obtained are transferred to a Knop medium with 1 mg/l IBA. The cultures are placed in the dark at 200C for 7 days then returned to the multiplication culture room. Boots then appear in less then one week. As soon as the root tips appear, the plants must be planted out. The shoots with root initials at their base are placed in specially adapted Melfert containers. These sonsist of a non woven sack containing a substrate of 70% pine bark, 25% sphagnum turf, 5% lignite ashes and 4 g/l osmocote 12/14 month fertilizer. The sack is a 25 x 10 cm which is rolled around the base of the cutting to form a 300 cm3 cylinder. The roots form and grow freely in this cylinder and to not forn spirals as is common with the majority of classical horticultural containers. When the rooted shoot is transferred from the test tube to a Melfert container, the agar is easily removed because the roots are not long. However, the Melfert containers must be moistened with warm water to remove sugar and to reduce thermic stress during transfer of the shoots. They are then placed directly in trays on irrigation sheets in a controlled climate glasshouse at 20-250C. For the first week, 100% humidity is maintained by a transparent plastic sheet placed over the trays. This technique gives over 90% survival. Plant growth is vigorous and it is impossible to distinguish a plant from in vitro culture from a classically produced seedling.